Today is a blessed day for a lot of reasons. First, it is Divine Mercy Sunday. Second, we are celebrating the canonization of Pope John XXIII and Pope John Paul II. Make that Saint Pope John XXIII and Saint Pope John Paul II. Myself, instead of being able to pray for much of the day, I will be working a 15 hour shift. A long day. But Saint JPII spoke quite a bit during his papacy about the dignity of human work, so perhaps this is appropriate. I joined the Catholic Church under Pope Benedict XVI, in 2007, so Pope John Paul II was not “my” pope, but in a way he was. He was the Pope for most of my life. I clearly remember watching the days surrounding his death, funeral and the conclave electing Cardinal Ratzinger. And I consider him as family. The third point is kind of an interesting story. Growing up, we spent a lot of time visiting with my Memere (great-grandmother). She would always have tomato-rice soup simmering on the stove, mincemeat pies in the freezer, and had a toaster oven in her kitchen, which I thought was rather unique and “old-fashioned” as we had a regular toaster. In the entryway, she had a display cabinet filled with pairs of salt and pepper shakers — souvenirs. And in the living room, there were two large photographs on the wall in matching oval frames. The twist comes from the fact that she was from Quebec and grew up speaking French. So, when I was young and visiting, I’d ask, “Who’s that?” for each of the photos. And she would reply, “Pepe,” which is similar to saying “Papa”. I assumed that both pictures were of her husband, my great-grandfather, who had passed away when I was only about a week old. They were black and white photos, which — to me — meant that they were taken A LONG TIME AGO. In both of the pictures, the man’s clothing seemed a little odd, but I just figured that people wore odd clothes way back then. However, only one of the photos was of my Pepe. The other was a photo of Pope John Paul II. 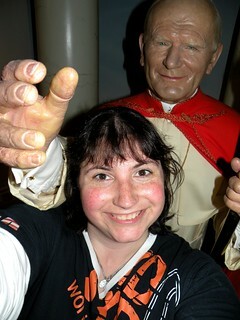 I grew up thinking that Pope John Paul II was my great-grandfather. He was a part of my family. And, I suppose, when I was baptized, he *did* become my family. Who knows what kind of influence this happy mistake may have had on me? Perhaps it was something as little and seemingly coincidental as this which led to me becoming Catholic later in life. You never know all the subtle ways the Holy Spirit may be guiding you. I love you, Papa. Please pray for me and those whom I love.